You didn't want to be my friend in elementary school. You didn't want to be my friend in junior high school. And you certainly weren't my friend in high school. Why on Earth do you want to be my Facebook friend today? God put haters on this earth for two reasons: 1. To motivate others. 2. To give no lives a job. Behind every successful student, there is a deactivated Facebook account. Who needs television when you have so much drama on Facebook. Facebook should have a limit on how many times a relationship status can be change ... after 3 times it should be change default to UNSTABLE! That awkward moment when you realize Dora has more freedom than you. Where can I get one of those Kim Kardashian or Paris Hilton jobs where they just kind of pay you to exist? The only thing that could stop me from taking selfies is a photo of what I look like taking selfies. Face book is a very popular social networking website, interconnecting millions across the world. Face book, originally called Face smash, is a brainchild of Mark Zuckerberg. There are various applications, games and other interactive features that face book provides to all its members. Every member who has an account on face book has a homepage which is popularly called the "wall". On the wall, there is a space, where the face book user can speak his mind and use it to communicate or share his feelings with other face book users, whom he or she has listed as his friends. 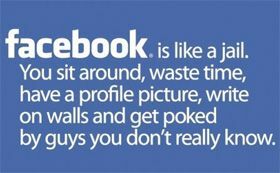 Funny face book status indicates any such status update which generates a lot of laughter and which people find really amazing. In the words of Sophia Bush, "I think the sexiest thing on anybody is intelligence. I respect somebody who has a brain and wants to use it more than a pretty face and status."